Hi, i thought it would be nice to show my POV project here, i've made it a few months ago, but when the day's are becoming shorter i can use it more often. The whole thing is based on a pic16f628A, with some SMD mosfets to power the led's. 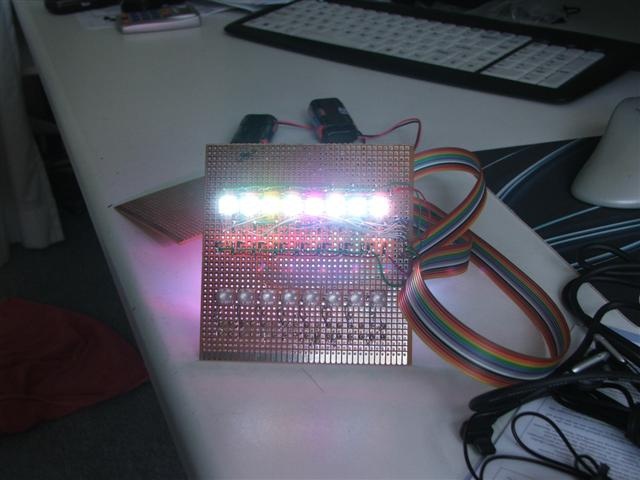 Those are very bright RGB led's with SMD resistors for smaller PCB size and lower weight. 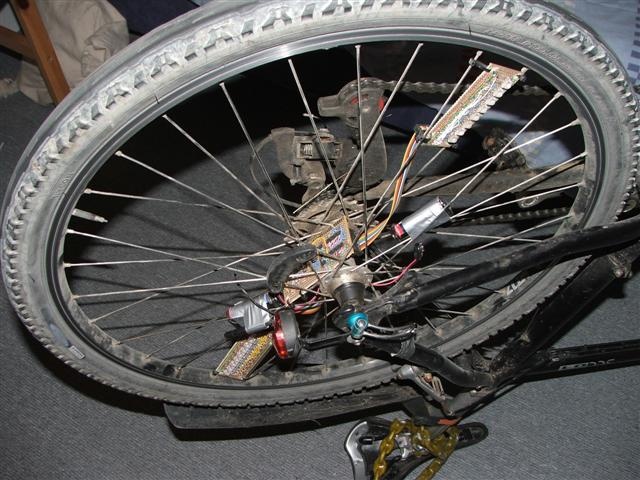 That's important too when keeping in mind that a heavy weight could give a unbalanced wheel. When all the led's are on ( 32 led's, each 3 colors, it draws 10Watt, but normally it will use less than 1 watt. Power comes from 4 NiMh AA cells. And there lifetime before charging is very long. Keeping the rotation synchronized with showing the text is possible by 2 reed sensors. So each rotation shows twice the image. You could do it once, but that means half the refresh rate. The FET's, 3 for the colors and 8 for the rows. 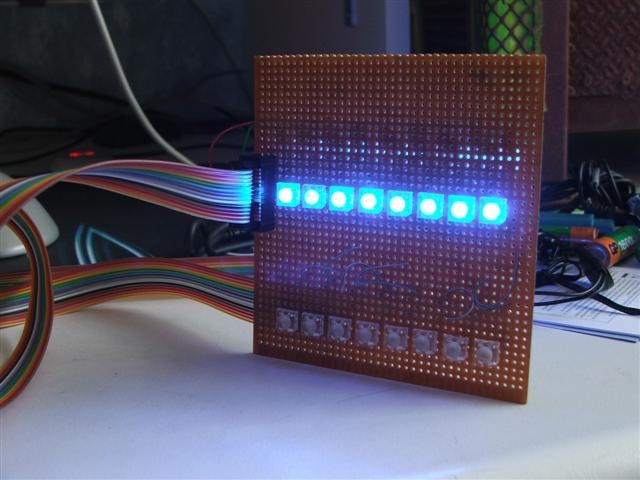 The led's are connected in a matrix. 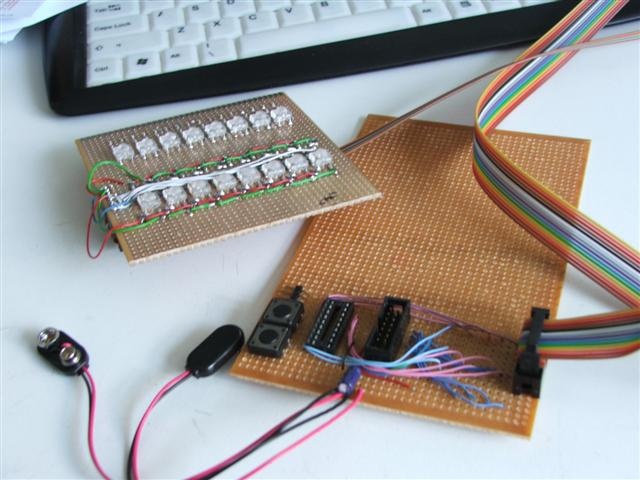 While designing the POV thing i wanted to use a shift register, but i wasn't able to send data to it in assembly. I guess it's possible somehow to send serial data with a shifting bit but i couldn't fing any information about it on the Internet. Testing it before the final mounti, gaffa tape rules hehe. i also had to put a clear coat over it to keep dust and water away from it. The result. 2 led's seems to produce a dead 'sub pixel', i still should repair them. I wish i could make a movie of it, but i can't film while riding, and the referesh rate of a video camera produces visual inference with the wheel refresh rate. Off course any effect, color, text or symbol is possible. My program skills aren't perfect, but still i was able to design this with quite simple code in assembly. Actually it was a great learning project to see what a PIC can do. When i have more experience i want to put every symbol in the EEPROM memory instead of programming it, to save space i could use for different effects like a speed meter. Anyway, people on the street love it this way too, so upgrading it isn't a mayor thing to do. Kids are watching an say "wow mammie, look there!" With the upcoming cristmas and newyear i need a new text in it, any suggestions? Or just "happy new year"? click It's not very recent, because i have the recent file on my other PC with i use for programming. Very nice. If there was the clapping smily I would put it here. You get "major props" for using surface mount components. I'm trying to start using them more often, but I don't have many of them. I do have a question for you though. Why the 16f628a? The 18F series is pretty powerful and can be programmed in C. Once I went to C, I cringe at the thought of going back to assembly for any moderatly complex program. Impressive work with the surface mount components! Lol, i thought "lets post this thing" when i saw the new year contest, and now it's even on the frontpage I have the HG site in my RSS reader, because all the funny and amazing electronic projects. A nice addition, here is a video of the POV writing "merry christmas and a happy new year"
I wrote it yesterday evening. I'm used to solder SMD, even with a normal soldering station. Everyone with soldering skills can! I learned it due to some repairing and modifications on electrical equipment at my work. it's not that hard, only half the size of a normal DIP case. 1 side (4 pins) is Source, 3 pins are Drain and 1 pin (which i bended up a little bit) is the Gate. The SMD resistors fit nicely on standard size soldering pads. Oh and why i used the 16f628? Because i don't know C, and learned the assembly code by studying some example programs. I wish i had more program skills but it takes so much time. I guess there should be many way's to make it shorter, faster or with better effects (what about PWM the colors for example?). I hope i could learn that with some more testing, building other projects and reading examples. For now i could only appreciate people who make there own PWM controlled RGB led's. I can't write such a code. Trust me _ferry_, you are light years ahead of the game. Nice project. The PWM will come naturally and the hard part was already done: sychronizing display with external reed sensor feedback. 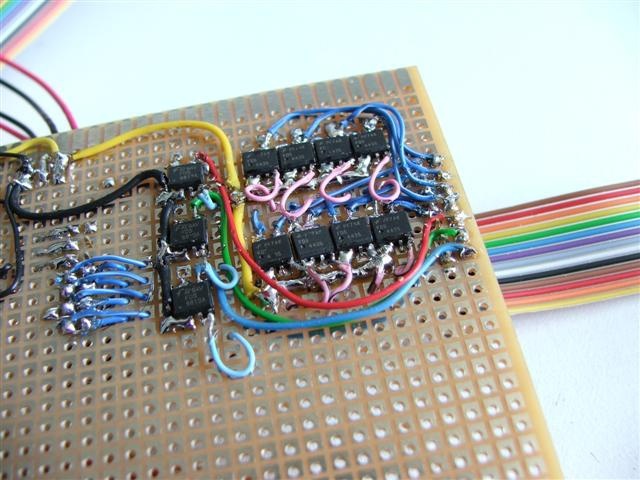 The next step as you say is to use EEPROM. Not much EEPROM in the PIC but its a start that does not require additional parts. 16f648 holds more space and will accomodate a large number of patterns and characture set. You can also create a hard coded characture set. EEPROMing and updating EEPROM via serial, IR, or USB just adds the feature of LIVE updating and customization. 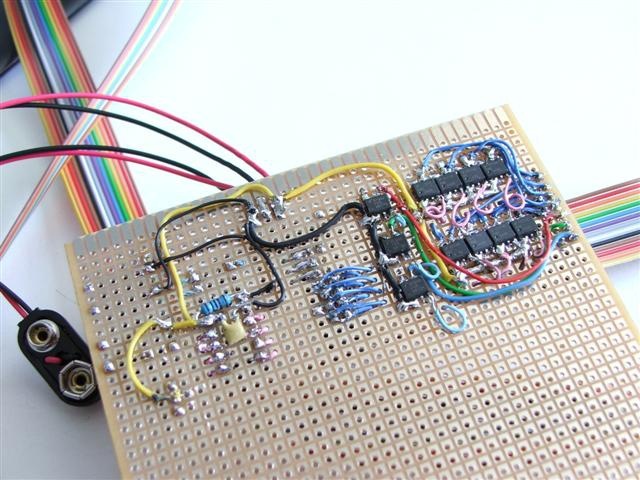 The PIC chip alone can house all the patterns you want once you use the space effectively. Now, where did you get the RGB LEDs? I can barely find then and when found the price is unreasonable and the brightness level is a joke. For a single self project not to bad, but I produce boards and sell them. Do you have a source vendor? 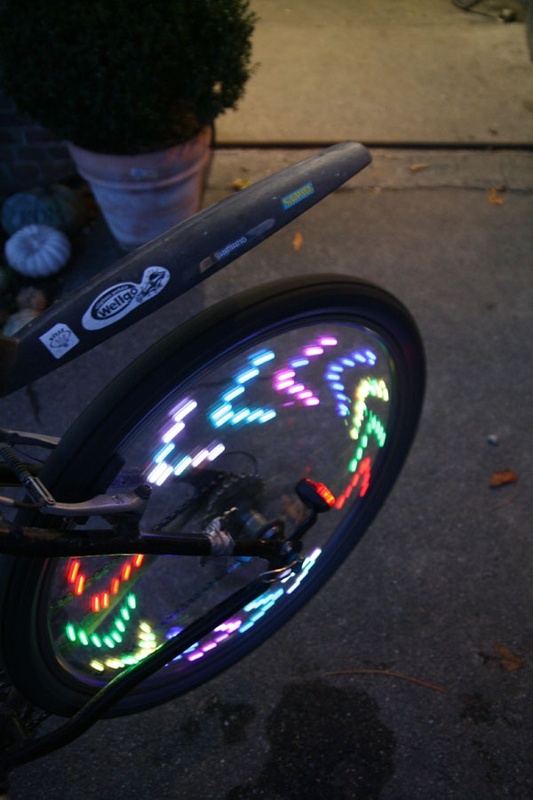 These led's cost �0,55 each, both Common Anode or Cathode. Hi, Do you have listed the workings of this pov somewhere?